Please feel free to call in and visit us at this year’s LAMMA 2018 Hall 5 stand number 531 sales staff will be on hand to answer any questions and offer advice. FERRI excavator mounted flail and mulching heads . BIO JACK excavator and forestry crane energy harvesting grapples. Get the New Year off to a great start. 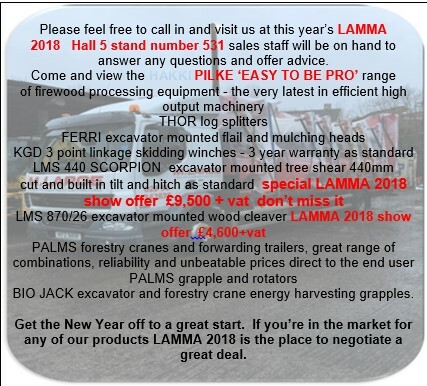 If you’re in the market for any of our products LAMMA 2018 is the place to negotiate a great deal.